It's 1920s New York City. It's flappers and Follies, jazz and gin. It's after the war but before the depression. And for certain group of bright young things it's the opportunity to party like never before. For Evie O'Neill, it's escape. She's never fit in in small town Ohio and when she causes yet another scandal, she's shipped off to stay with an uncle in the big city. But far from being exile, this is exactly what she's always wanted: the chance to show how thoroughly modern and incredibly daring she can be. But New York City isn't about just jazz babies and follies girls. It has a darker side. Young women are being murdered across the city. And these aren't crimes of passion. They're gruesome. They're planned. They bear a strange resemblance to an obscure group of tarot cards. And the New York City police can't solve them alone. 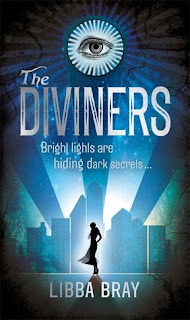 The diviners is a beast of a book at almost 600 pages long. Make sure you've cleared a day or two to read it! For me the book had several things that were really interesting for me as a reader. Firstly I loved the historical side of the novel. As a reader you find yourself completely immersed in the world of 1920s America and all the glitz and glamour of the flappers and speakeasies. The historian in me delighted in this completely. I loved Evie completely. She's such a teenager with all her rebelliousness ways wanting to go off partying hard every night and coming home early hours of the morning. I loved following her story and seeing the way she reacts as the story goes on. I really loved getting to know more about her abilities and the way she used them to help with the murder mystery at the centre of the story. The main part of the story centres around a murder mystery with a twist as it becomes apparently that something out of the ordinary is involved with a series of murders happening across the city. Without giving too much away I loved finding out more about the mystery and then the further twists and revelations that came afterwards. An awesome start to what promises to be a fantastic series and one of the few books I will make an effort to reread sooner rather than later. Love the sound of this, will definitely pick it up. I'm still put off by the size of this book! It sounds incredible .. but 600 pages! this one sounds amazing and its really high on my wishlist, I just have to wait til payday and its mine!!! Thanks for feeding my excitement of it!